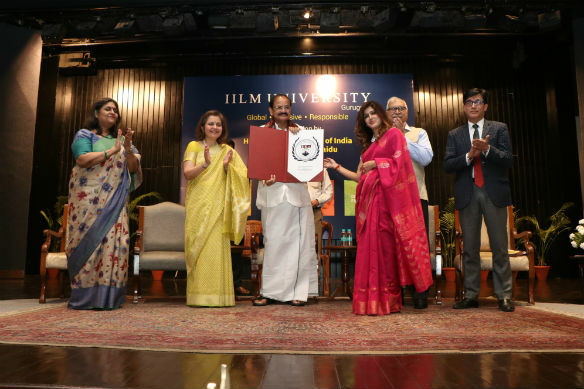 New Delhi: IILM University, Gurugram was inaugurated by Honourable Vice President of India Shri M. Venkaiah Naidu today. IILM University has been set up under the Haryana Private Universities (Amendment) Act 2018 which will open its doors to the students from the current academic year starting from July 2018. In his vote of thanks Mr.Raj Nehru said “Nation & society cannot progress until the education we provide synergises physical, mental and emotional aspects with the spiritual value system of a human being. Backed by the 25 years’ experience in responsible higher education of IILM Education Trust, IILM University aims to become a leading Liberal Arts University in Asia, with a focus on Entrepreneurship, Innovation and Technology, imbibing skills for lifelong success. “Center of Excellence in Skills” has been set up by the University which will be focused on National Skill Development Mission to fulfill the growing need in India for skilled manpower. These skills would directly lead to employability. The University’s central location in Gurugram allows it to enjoy a strong industry interface which in turn facilitates delivery of this new age curriculum and easier access to employment opportunities. The University will also have a 40,000 square feet incubation center at the University campus to promote entrepreneurship among students. In lines with “Start Up India, Stand Up India”, the IILM incubation center will enable students to start up their own businesses enabling employment generation and wealth creation. One of the unique features of the University shall be “The Center of Excellence in Sustainability and Innovation” which is aligned to promoting the United Nations Sustainable Development Goals. IILM has been a UN PRME champion business school since 2010 and works closely with the UN Global Compact in India to promote CSR and Sustainability.